David Rowland’s 40/4 chair is arguably the most significant chair design of the past 50 years. Over 8 million 40/4 chairs have been sold since its introduction in 1964. 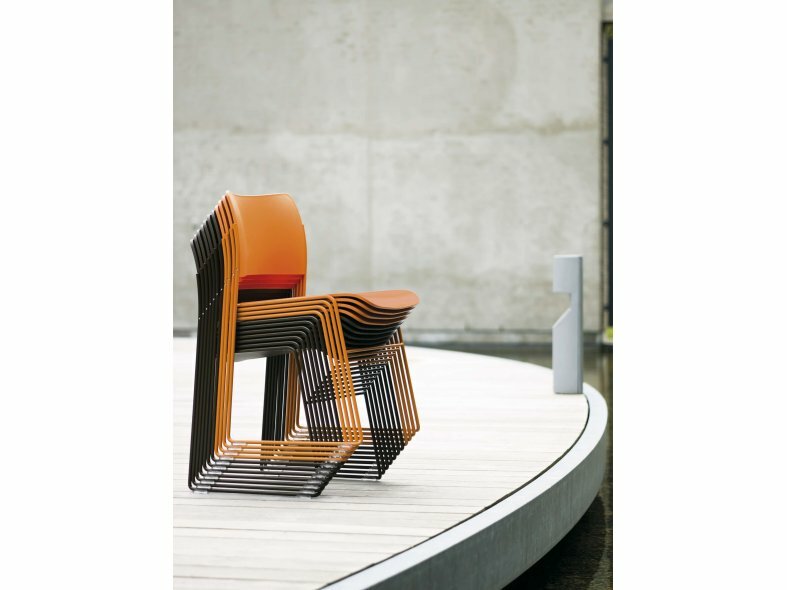 Honored with numerous design awards, and exhibited in several museums all over the world, the 40/4 chair has a wide appeal, whether for its excellent ergonomic features, its graceful lines and durability or its unique space-saving attributes, there are at least 40 good reasons to choose this design icon. Renowned for its unsurpassed stacking and handling characteristics along with its elegant aesthetic, 40/4 is rightly a great favourite of specifying architects and designers. 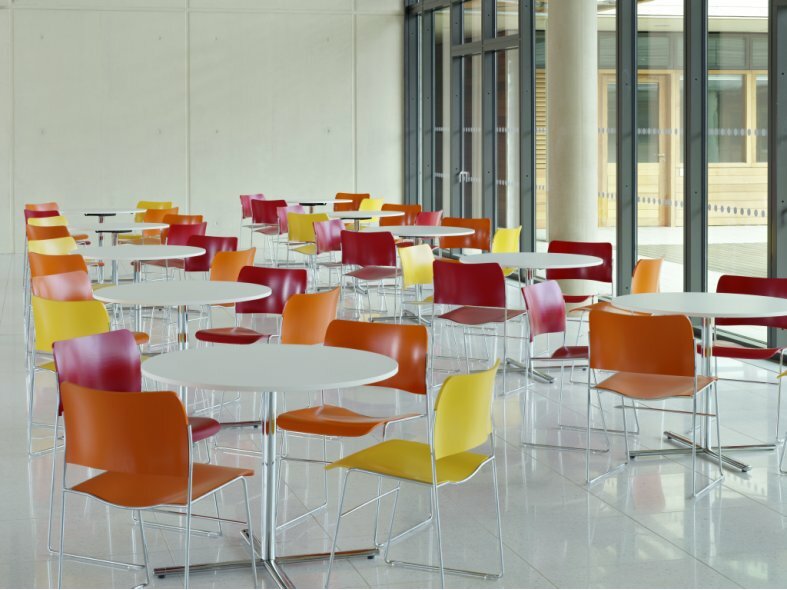 With seats and backs in plastic resin, finely crafted wood veneer or as upholstered version, 40/4 does great service across the board in schools, universities, churches and cathedrals, as well as in corporate offices, conference centres and training establishments. 40/4 is also available in armchair, barstool, lounge chair, swivel chair, outdoor variations, and with wood frame. The 40/4 chairs triple curved form moulds to the natural contours of the body. The waterfall seat design does not restrict blood circulation preventing undue pressure under the thighs. The stacking of the chairs is ergonomically correct - the chairs only have to be lifted low to slide from front. The seats, backs, armrests, frames and chroming are all produced according to ISO14001 standards. All parts of the chair can be dismantled and recycled. The 40/4 chair is a multi-purpose stacking chair suitable for conferencing, meeting, training, dining and visiting use. Stackable up to 40 chairs on dolly. The surface veneer has a matt lacquered 0.6 mm knife-cut sanded veneer on both sides. The inner layers are in 1.2 mm rotary cut beech: 7 layers on seat and armrests, 9 layers on the back. The thickness of the seat is 9-10 mm, back 10-11 mm and armrest 9-10 mm. Standard finishes: maple, beech, oak, cherry, ash, birch, walnut, and black stained. The plastic resin is a PA6 with fire-retarder. The surface is slightly textured and matt coated. The thickness of the seat is 5.5-10 mm, back 6.5-10 mm and armrest 10 mm. Standard colours: Howe grey, Ayers Rock red, Black, Blue eyes, Coconut, Mandarin, Olive green, Marine blue, Aubergine and Mint Turquoise. The metal is cold rolled steel. The surface is slightly textured and matt coated. The seat and back are made from 1 mm coil. Blanks are formed and edge is curled in a die. The seat has been reinforced with a stamped bottom plate. Seat/back are mounted with rivets to the frame. Standard colours: Black ME200, White ME300, Red ME110. The sled frame is in round, solid steel rod (Steel quality C15K, norm EN10278/ISO 286-2). Side chair (linking and non-linking): Ø11 mm rod. Armchair: Ø11 mm rod/Ø13 mm rod at rear legs and arm support. Frame finish comes in chrome (min. 20 μ),satin chrome (min. 20 μ) or black, alu grey or Howe grey powder coating (min. 50 μ) as standard. The glides are in transparent polycarbonate (PC). Glides with integrated moulded felt are optional. On chairs with integrated linking one male and one female glide apply. The side chair is available with integrated linking systems, providing strong and efficient linking for mass seating. The linking systems are an integral part of the frame and are a solid three-point connection; 2 integral frame joints plus an inter¬locking glide joining point. The side chair is available as a lounge version with lower seating height, wider seat and a more leaned back seating position. The solid steel rod (steel quality C15K, norm EN10278/SOP 286-2) is Ø11 mm.The lounge version is available in veneer and upholstery finish. The side chair is available as barstool version with seating height of 769 mm as standard. Seating heights from 550 mm to 800 mm also available. The seat and back is more narrow and seating position more leaned back for optimal comfort. The solid steel rod (steel quality C15K, norm EN10278/ISO 286-2) is Ø14 mm. 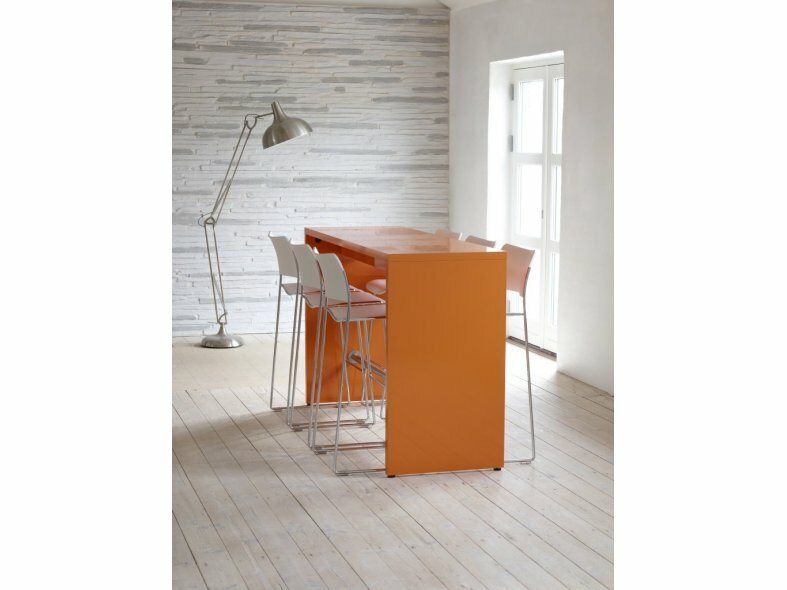 The bar-stool version is available in veneer, plastic and upholstery finish. The side chair, armchair and barstool are available for outdoor use. The frame is treated with e-coat and powder coated on top - standard colour is alu grey. The seat and back in PA6 are lacquered for outdoor use - standard colour is black. The frame, seat and back can also be ordered in any colour from the RAL-fan. The outdoor version is thoroughly tested to outdoor conditions. The 40/4 swivel chair is available in side chair and armchair versions. Choose between castors or glides. It is height adjustable providing a seating height span from 450 mm - 565 mm on castors and a seating height span from 425 mm - 540 mm on glides. The seat, back and armrests are available in plastic resin (PA6), veneer and upholstery finishes. The solid steel frame (steel quality C15K, norm EN10278/ISO 286-2) is Ø13 mm. The seat support is in steel, and the aluminium die cast spindle dimension is Ø28 mm. Castors with integrated wheel brakes are with HOWE grey core and zinc corpus. Glides in PP. The 40/4 wood frame is an alternative to the original chair with its iconic steel rod sled frame. The goal was to retain the proportions, angles, and characteristic curves whilst giving the choice of a different material. The frame is pressed veneer with the dimensions of 27 x 23 mm. 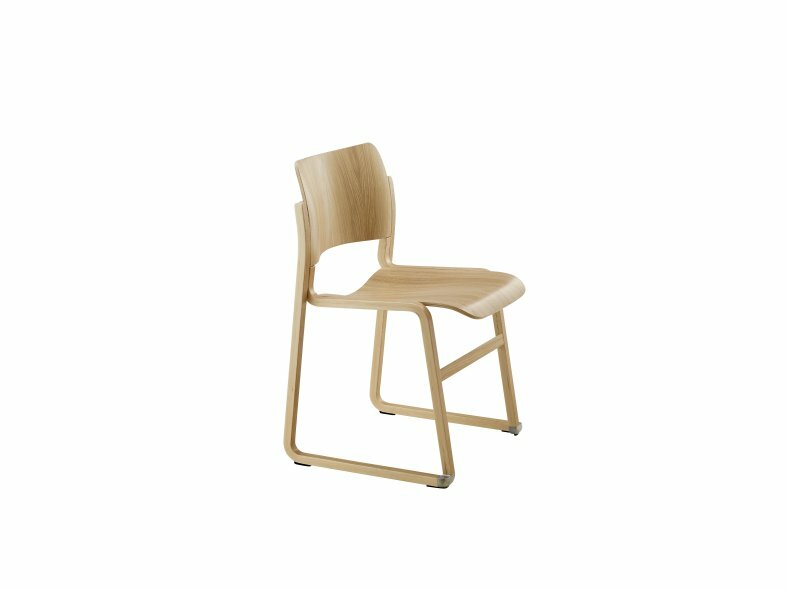 The 40/4 wood frame is available as a side chair and as an armchair with and without an integrated seat pad. The standard finishes are beech and oak as well as black stained and walnut stained. A floor linking system is available for the side chair. The linking brackets are retrofittable. The upholstery is in fabric, trevira, microfibre, leather or PU. The back is fully up¬holstered. As standard the cushioning is fire retardant CMHR polyurethane foam. Thickness is 20 mm on the seat and 8 mm on the back. Foam density is 55 kg/m3 on the seat and 32 kg/m3 on the back. Arm rest: 15 mm thickness and density 32 kg/m3. Polyurethane foam with a thickness of 8 mm on seat and 6 mm on back is optional. Foam density is 80 kg/m3 on the seat and 35 kg/m3 on the back. The side chair in veneer and plastic is stackable up to 40 chairs in height of 1445 mm on dolly. 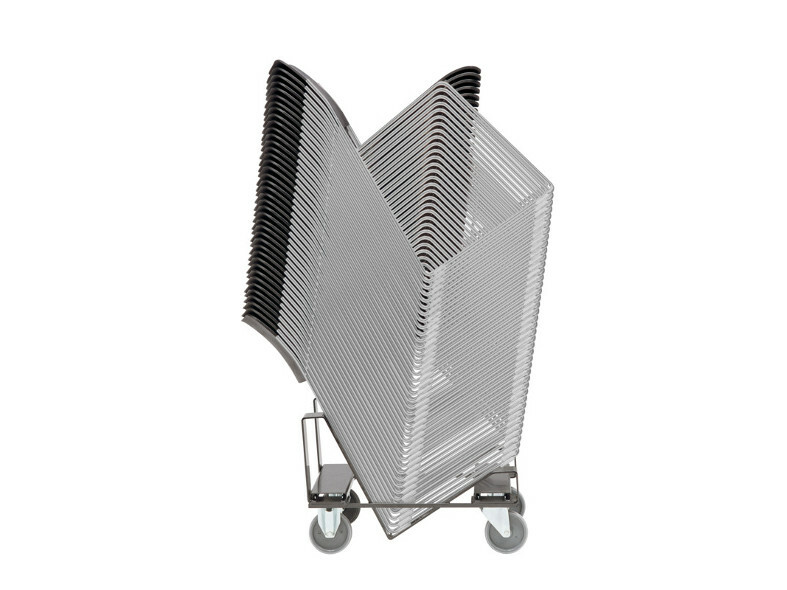 Rows of 2, 3, or 4 linked chairs can be lifted and stacked without separation on double, triple or quadruple dollies. The upholstered side chair is stackable up to 25 chairs in height of 1560 mm on dolly. The armchair (all versions) is stackable up to 25 chairs in height of 1770 mm on dolly. The lounge chair is stackable up to 20 chairs on floor. 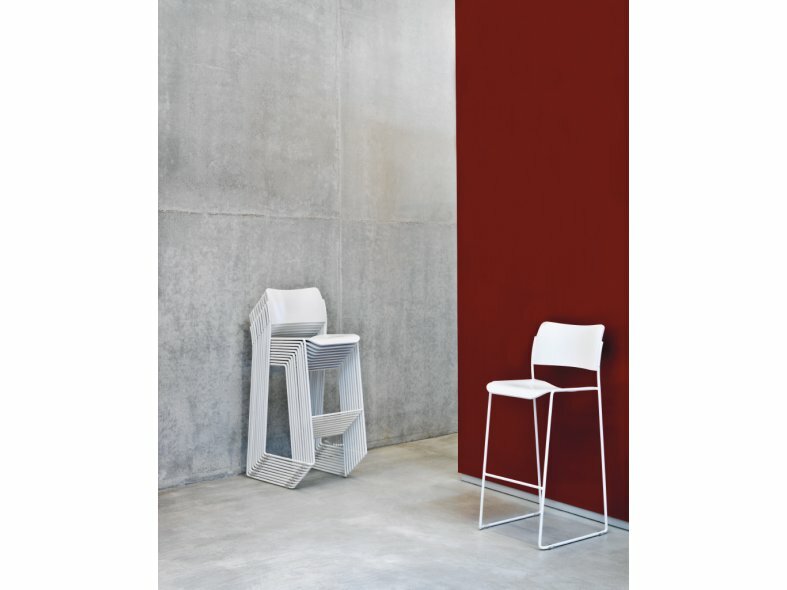 The barstool chair is stackable up to 15 chairs on floor. The 40/4 wood frame is stackable up to 25 chairs in height of 1644 mm on dolly and up to 12 chairs on floor in height of 1090 mm. The 40/4 wood frame with seat pad is stackable up to 20 chairs in height of 1533 mm on dolly and up to 10 chairs on floor in height of 1072 mm.